Helmut Heinrich Waldemar Schmidt (December 23, 1918 - November 10, 2015) was a German Social Democratic politician who served as Bundeskanzler (Chancellor) of West Germany from 1974 to 1982. Previous to becoming chancellor, he had served in the Hamburg Senate (1961-1965), as Minister of Defense (1969-1972), Minister of Finance (1972-1974), and briefly as Minister of Economics and Technology (July to December 1972). He was a member of the European Parliament from 1958 to 1961. On October 1, 1982 parliament approved a Vote of No-Confidence and elected the CDU chairman Helmut Kohl as the new Chancellor. This was the first time in the history of the Federal Republic that a Chancellor was ousted from office in this way. He co-published the German weekly, Die Zeit, after leaving office. He is co-founder of the Inter Action Council of former heads of state and government as well as of the G8. A father of the "Euro" (single European Union currency), he was a committed supporter of European unity throughout his career. He advocated that in an increasingly inter-dependent world, strategies based on national units are anachronistic. Greater unity between nations, with common fiscal and social policies, in this view, lays a solid foundation on which peace can be built. Through such international bodies as the Inter Action Council, Schmidt pursued an agenda designed to create the conditions for peaceful resolution of conflict, and to end war. Speaking before the United Nations General Assembly on May 26, 1978 he said that his own nation was "doing everything in [its] power to make it come true that the nations of the world will find their way to lasting peace." Schmidt experienced the horror of war as a young man, and set himself the personal and political task of working for peace. In 1983, though, he did support the deployment of missiles in Germany in response to the Soviet Union's missile superiority. However, he pursued - and convinced NATO into pursuing - a "two-track policy" which used détente first, then the threat of deployment. Schmidt, who spoke openly about his personal faith, was been a strong voice for tolerance and dialogue between people of different religions. He also supported universal acceptance of a Global Ethic, and of basic human principles. Schmidt helped to shape the European space as a community in which social justice, peace and prosperity may be achieved for all, a model for others to emulate. He said that peace is a real possibility. However, it demands compromise in given conflicts and must always be recreated. Not even as a soldier, despite the fact that I am a native of Hamburg, where in 1943 some 30,000 to 40,000 people were killed by the British in a single week. But the people of Hamburg have been Anglophiles since the Napoleonic Wars and they held it less against the British then against Hermann Göring, who had failed to protect them. Schmidt's father was the illegitimate son of a Jewish businessman, although this was kept secret in the family. This was confirmed publicly by Helmut Schmidt in 1984, after Valéry Giscard d'Estaing had, apparently with Schmidt's assent, revealed the fact to journalists. Schmidt himself is a non-practicing Lutheran although he regards himself as a Christian. Schmidt had joined the Social Democratic Party (SPD) in 1946, and from 1947 to 1948 was leader of the Sozialistischer Deutscher Studentenbund, the then-student organization of the SPD. In a 2008 interview, he said that he had never heard the "word democracy" until after the World War. He was elected to the Bundestag in 1953, and in 1957 he became member of the SPD parliamentary party executive. A vocal critic of conservative government policy, his outspoken rhetoric in parliament earned him the nick-name "Schmidt-Schnauze". In 1958, he joined the national board of the SPD (Bundesvorstand) and campaigned against nuclear weapons and the equipping of the Bundeswehr (German military) with such devices. In 1958, he gave up his seat in parliament to concentrate on his tasks in Hamburg. From February 27, 1958, to November 29, 1961, he was a Member of the European Parliament, which was not directly elected at the time. The government of the city-state of Hamburg is known as the Senate, and from 1961 Schmidt was the Innensenator, that is Minister of the Interior. He gained the reputation as a Macher (doer) – someone who gets things done regardless of obstacles – by his effective management during the emergency caused by the 1962 North Sea flood. Schmidt used all means at his disposal to alleviate the situation, even when that meant overstepping his legal authority, including federal police and army units (ignoring the German constitution's prohibition on using the army for "internal affairs"; a clause excluding disasters was not added until 1968). Describing his actions, Schmidt said, "I have not been put in charge of these units; I have taken charge of them!" This characteristic was coupled with a pragmatic attitude and opposition to political idealism, including those of student protests, best symbolized by his well known remark that "People who have a vision should go see a doctor." In October 1969, he entered the government of Willy Brandt as defense minister. In July 1972, he succeeded Karl Schiller as Minister for Economics and Finances, but in November 1972, he relinquished the Economics department, which was again made a separate ministry. Schmidt remained Minister of Finances until May 1974. He became Chancellor of West Germany on May 16, 1974, after Brandt's resignation in the wake of an espionage scandal. The worldwide economic recession was the main concern of his administration, and Schmidt took a tough and disciplined line. During his term, West Germany had to cope with the 1973 oil crisis; according to some judgments, West Germany managed better than most of industrial states. Schmidt was also active in improving relations with France. Together with the French President Valéry Giscard d'Estaing, he was one of the fathers of the world economic summits, the first of which assembled in 1975. Between 1975 and 1982, he was the only "statesman who attended all eight summits." D'Estaing paid the first ever visit to West Germany by a French President in October, 1979. He remained chancellor after the 1976 elections in coalition with the Free Democratic Party of Germany (FDP). Regarding the terrorist Red Army Faction, he held to a tough, no compromise line. Specifically, he authorized the GSG 9 anti-terrorist unit to end the hijacking of the Lufthansa aircraft Landshut by force in the Autumn of 1977. 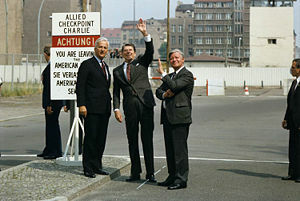 He was the first Chancellor to visit Auschwitz in November, 1977. However, his long feud with Menachem Begin made a state visit to Israel impossible during his Chancellorship, and obscured his "diplomacy concerning the legacy of the Holocaust." Yitzhak Rabin however visited Schmidt in July 1975. Then, West Germany had made reparation "In compensation for the horrors of the Holocaust … of more than $20 billion, including $800 million to Israel itself." On November 9, 1978 he called for "Honesty and Toleration" in a speech at the Cologne Synagogue. The feud with Begin began when Schmidt proposed selling German Leopold tanks to Saudi Arabia and Begin rebuked him with reference to the guilt he shared for the Holocaust. The sales deal, in the end, did not proceed. Concerned about the Soviet Invasion of Afghanistan and the Soviet superiority regarding missiles in Central Europe, Schmidt issued proposals resulting in the NATO Double-Track Decision concerning the deployment of United States medium-range nuclear missiles in Western Europe should the Soviets not disarm. This used détente with the threat of deployment in reserve. Critics saw this as warmongering, and which led to division within his own party and to anti-missile demonstrations. Schmidt maintained that a show of strength was necessary as a deterrent. He was re-elected as chancellor in November 1980. The missiles were deployed in 1983. Schmidt believed "in creating a strategic equilibrium because" in his view "a balance of power reduces the likelihood that someone will press the wrong button." War between the two Germany's was thought by many to be a real possibility. However, speaking in the Spiegel interview of Leonid Brezhnev, Schmidt said that "Probably nothing would have happened under Brezhnev … he was actually afraid of war." At the beginning of his period as Bundeskanzler, Schmidt was a proponent of Keynesian economics; by the end of his term, however, he had turned away from deficit spending. Large sections of the SPD increasingly opposed his security policy while most of the FDP politicians strongly supported that policy. While representatives of the left wing of the social democratic party opposed reduction of the state expenditures, the FDP began proposing a monetarist economic policy. In February 1982, Schmidt won a Motion of Confidence, on September 17, 1982, the coalition broke apart, with the four FDP ministers leaving his cabinet. Schmidt continued to head a minority government composed only of SPD members, while the FDP negotiated a coalition with the CDU/CSU. During this time Schmidt also headed the Ministry of Foreign Affairs. On October 1, 1982, parliament approved of a Vote of No-Confidence and elected the CDU chairman Helmut Kohl as the new Chancellor. This was the first (and hitherto only) time in the history of the Federal Republic that a Chancellor was ousted from office in this way. In 1982, along with his friend U.S. President Gerald Ford, he co-founded the annual AEI World Forum. In 1983, he joined the nationwide weekly Die Zeit newspaper as co-publisher. In 1985, he became Managing Director. With Takeo Fukuda he founded the Inter Action Council of former heads of state and government in 1983. He retired from the Bundestag in 1986. In December 1986, he was one of the founders of the committee supporting the Economic and Monetary Union of the European Union (a single currency) and the creation of the European Central Bank. Contrary to the actual line of his party, Helmut Schmidt is a determined opponent of Turkey's entry into the EU. He also opposes phasing out nuclear energy, something that the Red-Green coalition of Gerhard Schröder supported. In recent years, Schmidt has been afflicted with increasing deafness. He wrote Außer Dienst (Off Duty) in 2008, in which he discusses his life, mistakes and also his faith. As Chair of the Inter Action Council, Schmidt sent the Secretary-General of the United Nations a draft "Universal Declaration of Human Responsibilities" in 1997. The text was written with help from followers of all the great religions and set out what he called the fundamental principles of humanity. Schmidt also chaired the High-level Expert Group Meeting, Vienna, Austria (20-22 April 1997) that had drafted the Declaration, marking the 50th anniversary of the Universal Declaration of Human Rights. Sponsors included Jimmy Carter and Mikhail Gorbachev. In November 2007, Schmidt said during an interview with his own German weekly Die Zeit that the United States was a greater threat to world peace than Russia. He argued that Russia had not invaded its neighbors since the conclusion of the Cold War and that he was surprised that Russia allowed Ukraine and other former components of the Soviet Union to secede peacefully. He noted that the United States' invasion of Iraq under George W. Bush was a war of choice, not of necessity. In October 1981, he was fitted with a cardiac pacemaker. The University of Germany's Federal Armed Forces in Hamburg was renamed Helmut Schmidt University - University of the Federal Armed Forces Hamburg in 2003 in honor of the politician who as minister of defense had introduced obligatory academic education for German career officers. Schmidt and his wife are both smokers. He is well known for lighting up cigarettes on TV interviews or talk shows. In January 2008, German police launched an inquiry after Schmidt was reported by an anti-smoking initiative for defying the recently introduced smoking ban. The initiative claimed that Helmut Schmidt had been flagrantly ignoring laws "for decades." Despite pictures in the press, the case was subsequently dropped after the public prosecution service decided that Schmidt's actions had not been a threat to public health. In September 2015, Schmidt underwent surgery for a blood clot in his leg. After initial improvement, his condition worsened again in November. Schmidt died in his Hamburg home on the afternoon of November 10, 2015, aged 96. A state funeral for Schmidt was held on November 23 at the Protestant (Lutheran) St. Michael's Church, Hamburg, where Loki Schmidt's funeral had been held. German Chancellor Angela Merkel, in remarks to mourners, said, "We developed a deep affection for our former chancellor out of esteem and respect over the decades. We were impressed by his personal modesty and his dedication to duty. Helmut Schmidt was a political institution in the Federal Republic of Germany. I always saw him as an authority – as somebody, whose advice and whose judgment meant a lot to me. We owe a lot to Chancellor Helmut Schmidt. His resoluteness helped us withstand the tribulations of international and German terrorism in the 1970s." Others who spoke included former U.S. Secretary of State Henry Kissinger. Speaking in German, he lauded Schmidt for "vision and courage", based on the principles of "reason, law, peace and faith," and said Schmidt had been "in a way the conscience of the world." Among the 1,800 who attended were German President Joachim Gauck and former French President Valéry Giscard d'Estaing, whose tenure in office paralleled Schmidt's as German chancellor. Other guests included former chancellor Gerhard Schröder, former presidents Christian Wulff, Horst Köhler, Roman Herzog and Hamburg's mayor Olaf Scholz. A flag-draped coffin containing the remains of the former chancellor, also a former German defense minister, was escorted by the German Army's Wachbataillon from St. Michael's to Ohlsdorf Cemetery for a private interment ceremony. Helmut Schmidt's remains were buried there one day later, in the family grave alongside the remains of his parents and his wife, Loki. Schmidt received honorary doctorates from several institutions, including the University of Oxford, Harvard University, Leuven University, University of Cambridge, Johns Hopkins University, the Sorbonne, Keio, Hamburg and Potsdam. Other honors include the Franklin D. Roosevelt Four Freedoms Award (1988) for commitment to the principles essential to democracy: freedom of speech and expression, freedom of worship, freedom from want, freedom from fear. Having served in the European Parliament early in his career, Schmidt was a strong supporter of European unity, of monetary convergence between members of the European Union and an early supporter of the single European currency. In lectures given at Yale University in 1985, he spoke of the anachronism of national strategies in an interdependent world. After Germany's defeat in World War I, the Allied powers placed punitive reparations on Germany and took other measures intended to prevent a massive rearming of Germany's military. As a result, Germany under Adolf Hitler reneged on reparations, re-armed and set out on a world-conquering campaign. Post World War II, a different strategy was pursued, one in which Germany has been able to prosper. Germany continues to be one of the leading economic powers. Schmidt was a co-founder of the G-8. Yet, as an economically powerful nation, Germany has remained committed to the peace and security of Europe and has continued to develop bonds of friendship with former foes. Schmidt enjoyed a positive relationship throughout his Chancellorship with France, which, before the founding of the European Union, was Germany's historical rival. Schmidt spoke openly about his belief in a higher moral conscience and in a higher power, and of peace as a "desirable political ideal," replacing war which for too long "was almost taken for granted as an element of politics." Peace is possible, he has said, "but we always need to recreate this peace" and it can rarely be achieved without compromise. His German biographer, Schwelien subtitled his book, ein Leben für den Frieden ("A Life for Peace"} which he saw as a fitting description of Schmidt's career. ↑ Helmut Schmidt and Wolfram F. Hanrieder, Helmut Schmidt, Perspectives on Politics (Boulder, CO: Westview Press, 1982), 51. ↑ 2.0 2.1 Helmut Schmidt, Off Duty (New York, NY: Random House, 2008, ISBN 978-3886808632). ↑ The German word Schnauze designates the mouth and nose area of an animal like a dog or a wolf; so the epithet indicates a ready wit and a sharp tongue, suitable for (metaphorically) tearing his opponents' arguments to pieces. ↑ Zalman Shoval, Don't count on Europe: Israel must continue to rely on America, realize Europe cannot replace it Ynet News, "Opinion" June 1, 2008. Retrieved August 26, 2016. ↑ Alan E. Steinweis, and Daniel E. Rogers, The impact of Nazism: new perspectives on the Third Reich and its legacy (Lincoln, NE: University of Nebraska Press, 2003, ISBN 978-0803242999), 239. ↑ Heir to the Holocaust. TIME. Retrieved August 26, 2016. ↑ Schmidt, "A Plea for Honesty and Tolerance: Speech at the Cologne Synagogue November 9, 1978." in Schmidt and Hanrieder, 1982, 195-204. ↑ David S. Wyman, and Charles H. Rosenzveig, The world reacts to the Holocaust (Baltimore, MD: Johns Hopkins University Press, 1996, ISBN 978-0801849695), 432. ↑ Cold War Interview With Ex-Chancellor Schmidt Spiegel International, June 26, 2008. Retrieved August 26, 2016. ↑ 10.0 10.1 Helmut Schmidt, "On a Politician's Ethics" Global Ethic Lecture, May 8, 2007. Retrieved August 26, 2016. ↑ A Universal Declaration of Human Responsibilities Inter Action Council, 1997. Retrieved August 26, 2016. ↑ Gabor Steingart, Nov. 20, 2007. How Dangerous is America? Der Spiegel. Retrieved August 18, 2008. ↑ Helmut Schmidt, 1982. "The Way of Freedom," in Paul Levinson, (ed.) 1982. In Pursuit of Truth: Essays on the Philosophy of Karl Popper, On the Occasion of his 80th Birthday. (Atlantic Highlands, NJ: Humanities Press. ISBN 9780710804242), xi-xii. ↑ Altkanzler Schmidt raucht trotz Verbots - Staatsanwalt ermittelt. Der Spiegel online. Retrieved August 18, 2008. ↑ Helmut Schmidt soll es sehr schlecht gehen Süddeutsche Zeitung November 9, 2015. Retrieved August 10, 2016. ↑ Altkanzler Helmut Schmidt ist tot Tagesschau, November 10, 2015. Retrieved August 10, 2016. ↑ German ex-Chancellor Schmidt dies at 96 BBC, November 10, 2015. Retrieved August 10, 2016. ↑ 18.0 18.1 In quotes - Helmut Schmidt's state funeral Retrieved August 10, 2016. ↑ Geladene Gäste nehmen Abschied von Helmut Schmidt Radio Hamburg, November 23, 2015. Retrieved August 10, 2016. 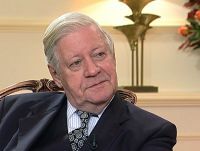 ↑ Helmut Schmidt ist bestattet NDR, November 24, 2015. Retrieved August 10, 2016. ↑ Schmidt and Habrieder, 1982, 195. Carr, Jonathan. Helmut Schmidt: helmsman of Germany. New York, NY: St. Martin's Press, 1985. ISBN 978-0312367442. Dönhoff, Marion. Foe into friend: the makers of the new Germany from Konrad Adenauer to Helmut Schmidt. New York, NY: St. Martin's Press, 1982. ISBN 978-0312296926. Levinson, Paul (ed.). In Pursuit of Truth: Essays on the Philosophy of Karl Popper, On the Occasion of his 80th Birthday. Atlantic Highlands, NJ: Humanities Press, 1982. ISBN 978-0710804242. Schmidt, Helmut. A grand strategy for the West: the anachronism of national strategies in an interdependent world. Henry L. Stimson lectures, Yale University. New Haven, CT: Yale University Press, 1985. ISBN 978-0300035353. Schmidt, Helmut. Off Duty. New York, NY: Random House, 2008. ISBN 978-3886808632. Schmidt, Helmut, and Wolfram F. Hanrieder. Helmut Schmidt, perspectives on politics. Boulder, CO: Westview Press, 1982. ISBN 978-0865312050. Schwelien, Michael. Helmut Schmidt ein Leben für den Frieden. München, DE: Heyne, 2006. ISBN 978-3453640177. Steinweis Alan E., and Daniel E. Rogers. The impact of Nazism: new perspectives on the Third Reich and its legacy. Lincoln, NE: University of Nebraska Press, 2003. ISBN 978-0803242999. Wyman, David S., and Charles H. Rosenzveig. The world reacts to the Holocaust. Baltimore, MD: Johns Hopkins University Press, 1996. ISBN 978-0801849695. Biography at the German Historic Museum (German). Kröten und Paragrafenwahn (German, 2006). Schmidt's talk on the occasion of China's Prime Minister Wen Jiabao visiting Hamburg (German, 2006).